This trio of handsets from Sagem Communications is an absolute bargain at £36.99. It's also environmentally-friendly, positively sipping power from the mains to keep the handsets charged; Sagem says its even cut the amount of radiation emitted by each handset. Cheap as the Sagem D16T trio is, it certainly doesn't look it. All the handsets are finished in matt black and silver, with large rubberised buttons giving you access to the phones' features. The rounded shape also enables each handset to sit comfortably in your hand - although you do notice then that the handset feels a little light, while the plastics used are obviously not of the highest quality. Accompanying the three handsets are the base stations: lead base station is also finished in black and silver and is obviously the one you hook up to your phone line. The other two are essentially chargers for the second and third handsets, but they're rounded matt black look makes them unobtrusive. All three handsets sit comfortably and securely their bases, and the bases are equally sure-footed in turn. It's when you come to set up the Sagem D16T handsets that you really notice where the corners have been cut: The mono 3 line LCD is decidedly old-fashioned and offers the bare minimum of features: you certainly won't be able to send and receive text messages, for example, while the 10 included 'melodies' are of the execrable chip music variety. Ugh. Entering contacts into the address book is a bit long-winded too, and you can't share details between handsets: you have to enter them all again for each one. At least the Sagem D16T won't give you hand cramp thanks to those big buttons, while accessing the different menu options is straightforward given the limited number of options available. In use the Sagem D16T proves very easy to use. It's obvious where the call buttons are (they're the big ones with green and red telephones on them); while call quality is clear and comprehensible, even if the built-in speaker lacks a little presence and bass weight. 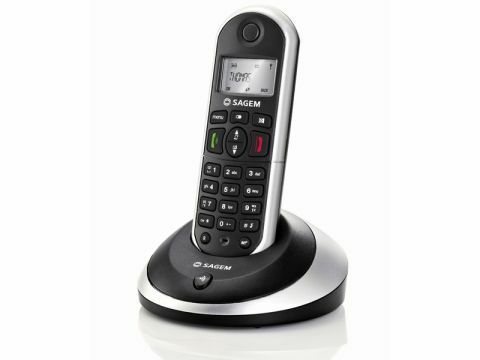 If you're on a tight budget or just want a trio of basic handsets, the Sagem D16T offer excellent value for money. But for fancy features or more eye-catching designs you'll really need to look elsewhere.